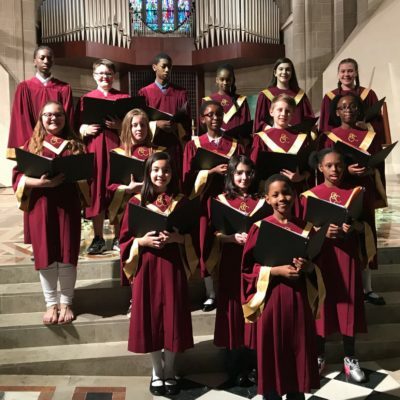 The mission of Cathedral Choir Academy of Detroit is to provide an experience in which choristers encounter Christ through sacred music, grow in faith aspiring to musical excellence, and give witness to the Word Incarnate. In residence at the Cathedral of the Most Blessed Sacrament in Detroit, The Cathedral Choir Academy serves both urban and suburban youth of all faiths, grades 3 – 9. Committed to the belief that all children can learn to sing well, the program welcomes everyone. With the primary goal of leading the sung worship at Mass, the program will foster a deeper understanding and appreciation of sacred music and its function in Catholic worship. Repertoire is inclusive of all styles and periods. With the implementation of a Kodaly curriculum, choristers will develop their vocal potential and learn to read and write music fluently. Striving for musical excellence and artistry in performance, the choirs also sing in concert throughout the Archdiocese of Detroit. Answering the Archbishop’s call to unleash the Gospel, choristers sing for the honor and glory of God. Admissions are generally continuous throughout the school year. Please call 313-883-2867 or email Susan Lindquist for an appointment. Tuition assistance available based on both ability and need. Invited into affiliation with the Sistine Chapel Choir, the Cathedral Choir Academy of Detroit is a comprehensive after school choral music program offering two levels of instruction; the Cathedral Descant Choir and the Cathedral Children’s Choir. The Cathedral Descant Choir (CDC) is a training choir through which choristers learn the basic skills of choir membership and choral ensemble singing. No audition is required for the CDC. The Cathedral Children’s Choir (CCC) is a treble ensemble striving for the highest level of artistry in performance and musicianship. While continuing to develop their vocal potential, choristers will learn more advanced music reading skills and sing two and three part treble music. Please call 313-883-2867 or email Susan Lindquist to schedule an audition. Susan M. Lindquist brings to the program over 40 years of teaching experience at all levels of music education. She holds a B.M.E. from Central Michigan University and was most recently employed as the music teacher and children’s choir director at Our Lady of Good Counsel Catholic School in Plymouth, MI. Susan has an extensive history as a choral conductor, both domestically and abroad. She is the founding director of the Counsellor’s Youth Chorale, a graded choir program at Our Lady of Good Counsel Parish comprised of 150 young choristers offering four levels of instruction, from grades 3 – 12. Under her direction, the Chorale has performed in Carnegie Hall, lead the sung worship at St. Patrick’s Cathedral in New York City, and performed at Disney World’s Epcot Center. In 2000, the chorale participated in the International Children’s Choir Festival in Canterbury and London, and performed at La Madeline in Paris. The choir’s most recent European tour included singing Masses at St. Peter’s Basilica in Rome, the Basilica of St. Francis in Assisi, and Mater boni consilii, thein Genazzano, Italy. Additionally, the chorale has performed with the Plymouth Symphony Orchestra, the Michigan Opera Theatre, and at National Association of Pastoral Musician Conventions throughout the Midwest. Susan is currently serving as the Dean of the Archdiocesan Academy of Sacred Music. Her leadership experience includes membership on the Board of Directors of the Bay Music Foundation, the Plymouth Symphony Society and past president of the Detroit Area Chapter of Chorister’s Guild. Mother of two children, Susan and her husband John reside in Plymouth and are members of Our Lady of Good Counsel Catholic Church.